Tata’s tale of small business success is as inspiring as it is unique –– and even serendipitous. Little more than four years ago, her and then long-distance boyfriend William Knopp crafted small items for one another, sending them via mail as love letters of sorts. It kept them connected while he was in Texas, she in California. It was around that same time that Knopp started his first Etsy account. The long distance proved trying, as it often does for couples, and the moment seemed right for Tata to pack her bags, move back down to Texas and join forces with her other half. I don’t know if you could start a store on Etsy and become as successful as quickly today. It was within this period of uncertainty that a friend recommended the duo put a few of of their items up on Etsy to make some extra cash –– and Son of a Sailor was born. Generating income from their Etsy store alone, the two used their spare time to master creating their pieces, ranging from small leather goods like keychains and jewelry to home pieces including cutting boards and flash drives. Then, they set off to showcase their goods at trade shows across the country. We didn’t create our own site until we got word from NYLON that we were going to be featured. William and Jessica are seeking to streamline their B2C offering, given that the manufacturing of their items is still mostly done by the two of them, with help from a handful of production assistants. While reaching many different markets can be a benefit, too many moving parts can end up taking too much time to manage. For them, it is essential to whittle down their distribution to only the most meaningful brands. This is especially necessary due to an ever-increasing demand for their products at the wholesale level. Wholesale has many benefits, but for Son of a Sailor, the volume of orders received and the exposure of the brand from both domestic and international exposure is the most important aspect of the business. Consistent wholesale relationships allow for Tata and Knopp to forecast their business operations appropriately, rather than relying on the fluctuating sales of an online store. That said, sales from their online store and their brick-and-mortar location now fully cover their rent –– plus some. In all, Jessica and William both swear by the b2b wholesale side of their business, giving it credit for their ability to scale from makers selling on Etsy to a full-blown, omnichannel boutique. And, neither of them are shy about sharing the details on how those big name brands found them. There is always what I call, ‘the chaos before the show.’ We live that everyday. 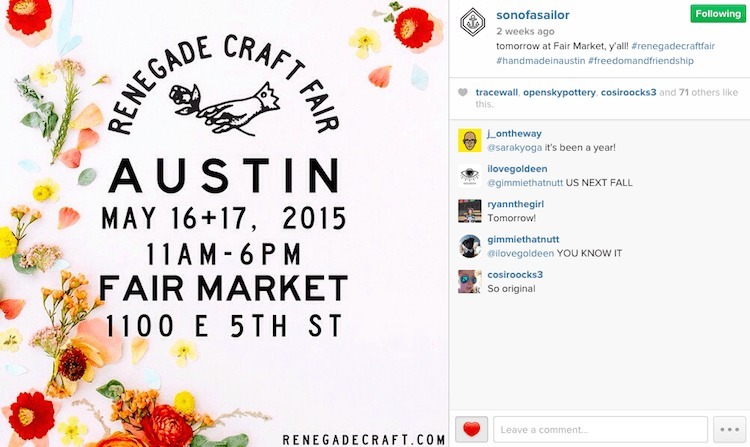 Renegade Craft Fair is the first craft market that we participated in, and one of the best happening these days. They host markets in Austin, San Francisco, L.A., Chicago, Brooklyn and London. Also, this year, they added Seattle and Portland, too. We’ve traveled with them to many of the shows since we began Son of a Sailor. Each show has allowed us to gain customers in a new part of the country, as well as wholesale accounts with local boutiques. They offer wholesale preview days for some of their shows, but shop owners typically frequent the market either way. This was an amazing way for us to gain exposure around the country, even as a young business. This was an amazing way for us to gain exposure around the country, even as a young business. I know that representatives from Anthropologie have been at quite a few of the Renegade shows that we have participated in. We’ve also met folks that work with Ann Taylor, Crate & Barrel, and CB2. POOL was the first tradeshow in which we participated, and was a wonderful proving ground for us to enter into the wholesale market. They offer Cash & Carry options, where vendors sell items to be taken with by customers, as well as Wholesale booths. The show allowed us to be seen by many large brands that frequent the Las Vegas fashion trade shows. The Cash & Carry option is a great entry point at a lower rate than most other trade shows, but we opted for a full wholesale booth out of the gate. The show allowed us to be seen by many large brands that frequent the Las Vegas fashion trade shows in August and February, and was a wonderful way for us to become familiar with wholesale trade shows. As one of the industry standard trade shows for gift shops, apparel and accessory stores, NYNOW is the largest trade show that we’ve participated in. We have met representatives from such a wide array of brands, including so many major labels here in the U.S. and around the world. It’s also a great place for meeting store owners of small independent boutiques, so it really covers the whole spectrum. Its a long show, and it’s not cheap, but we’ve found it to be a monumental show in the growth of our business. The most recent orders with Anthropologie came directly from our interaction with them at NYNOW. The most recent orders with Anthropologie that we received came directly from our interaction with them at NYNOW. It’s really opened up some amazing doors for us this past year! Do you have an inspiring start up story you’d like to share or questions for Jessica and William? Use the comments section below to let us know and we’ll be in touch.